rubyprose | "Her price is far above Rubies"
WHAT WILL YOU PUT ON YOUR BLANK CANVAS? We wake up each day to a new fresh blank canvas. WE can choose what we write in our own canvas. The brush is in your hand, the paint is wet, what are you going to write? Will you write words of positive thoughts, kind words to encourage or will your brush paint negative notes and take you down a path to rob your joy. 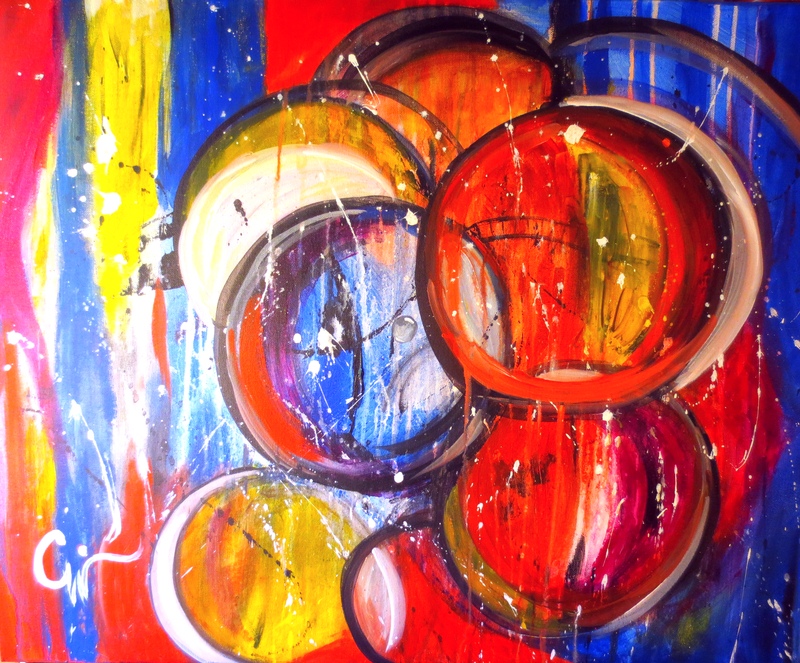 20″ x 20″ It Happened at a Political Event! I have been there, I have let negative thoughts after negative thoughts take over my mind and like soap suds with lot of water, these negative thoughts can take over and I have become overwhelmed with sadness. Each day we can start off with a fresh attitude and a renewed look on our life. Even if your day yesterday was full of stress or sadness, People let you down, you found out your pain was still sharp, how are you going to write on your canvas today? Will you grab the newness of the day and embrace the opportunities that could be there? I have had my share of hardships, I have also been incredibly broken. I have been in so much pain that I could not think of anything else, but I did not let those events write my story. I CHOOSE. When I write my own words, I choice to write positive words that will make me stronger. I choose to push those negative thoughts away and rewrite my story with positive words, even if I have to wipe off my words with white paint and start over. Here are a couple things you can to to help. Before sunrise each day, I start the day reading the Bible and asking for my day to be filled with God’s direction. There are times I fail this and instead put my agenda on the canvas and head down the path of getting in my own way to only find I missed the joy in waiting for God. God’s path which is ALWAYS better then my own. Write on your canvas a gratitude list. If you woke up in the morning, you are alive and this is huge!!! Be thankful for that!!! What about all those in your family that are still on this earth. Be thankful for those people! One of the silly things I am grateful is a strong wonderful cup of black coffee!!! Paint a Lemon!! No, actually, get a glass of water with lemon and drink. This actually helps you wake up and feel energized. Get mentally organized and write down what you are going to do. I hope you think about this, think about your beautiful blank canvas and what you are going to write or paint on your canvas. YOU DO have a choice. Make it a beautiful painting each day!! What Does God have to do with my weight loss journey? I pose the question to you: what does God have to do with my Weight Loss Journey? One thing I do know is that I fully believe God wants me to be have a healthy body. He tells us our bodies are the temple of the Holy Spirit. But what does that mean? I want to impress upon those that are taking their time to read this is that first, there is no mistake you are taking the time to read this and secondly, that unhealthy part of my journey was A PART of my journey. I feel God allowed me to experience this path as I learned so much during this journey which in itself is such a love story. God allowed me to grown when I was in a pretty bleak state. Sometimes God allows us to go deep to know what the light looks like. That was my story. I know when I was sorely overweight, I felt depressed and tired and this affected my thoughts, my art, my friendships, and so much more. The guilt side of my kept saying: “How could I be used by God if I was headed into a total health crisis?” But God was loving and stayed there with me and did not give up. The more overweight I got, the more I was dominated by feelings of defeat and inadequacy. I determined my self-worth in the world by the number on the scale. I felt judged by people when I am sure was NOT always the truth. I was also misled by thinking food was what I could turn to, to feel better. When I was sad, I told myself I deserved that bowl of macaroni. Then the more I made the wrong choice, the more I felt like I was failing. This seeped into many parts of my life and how I looked at life. Life became dim for me when things were compounded when I lost my mother. I was dealing with a silent struggle and there were days that hope was dim. I knew I loved God, which was what kept me focused on living, but those dim days were dark. I want to focus the next several of my blogs focusing on verses that can help in our health journey. It is not just about losing weight, it is about a path to a healthy life. Losing weight with the focus on God walking with you changes the focus from your body to your soul and that lasting lifestyle change begins in your heart. This is only the first part of a series I want to share with you on how God spoke to me and is still speaking to me on this journey of health. I HAVE DO MUCH TO SAY…. So hang on. FREEDOM is on the way! I LOVE YOU. Cheryl Wilson, Optavia Health Coach. He gives me His best! I just finished cleaning my suitcase from my trip to Florida…. and I found these beautiful seashells that I had packed in a special place to keep safe. While at the beach a few weeks past there was no one else out walking on this cool morning. But off in a distance, was this one lone gentleman in a hat that as I recall made me think of a man from Australia…. me past me, tipped his hat and smiled. As I sat on the beach enjoying the sun and the sand knowing soon I would return to the city, my mind forgot about this kind stranger. I soon took some photos and pushed my toes into the sand and felt as each moment pass, more relaxed. Soon, in the distance, I saw him returning. It was obvious as his shadow returned as again, no one else had joined the beach yet. This time he slowly walked up to me and handed me all these shells and he said … “I collected the best for you.” That was all he said, and turned an kept walking. Today as i think of the event and being Christmas I can not help think of how our Heavenly Father does the same thing for us!!! He collects the best for us and lovingly hands these gifts to us for us to enjoy. The Desires of Our Heart….Whose Dream is it? I have always heard the verse “Delight thyself also in the LORD; and he shall give thee the desires of thine heart.” This verse is found in Psalm 37:4. But what does it mean when God says he will give us the desires of our heart!! Does that mean I can list all the things I want and push that list up to God in a prayer like a list children do and send off to Santa? You might read that verse and focus on the second part of the verse as it might look more appealing!!! BUT, of course the result will be quite disappointing. The sentence is structured to read the first part of the sentence first…. “Delight thyself also in the Lord”…. to make this clearer, it means something like this…. Make God the object of our desires. I feel the verse is saying He will in turn give us our desires. I also think that if we make God the object of our desires, follow Him, pray for His direction, our hearts will be so right with God that our desires will be what is best for us! The question many people face almost daily is whether or not their desires are covetousness selfish wants. So how can we know our desires are from God? Again, read the first part of the verse, “delight in the Lord.” When we allow God’s word to renew our hearts and mind and we allow God to have His way in our hearts, we will find our desires are in alignment with His will and our desires are His desires for our life. When I started my art venture several years ago, a complete opposite direction from my professional career path, I promised myself I would NOT do it alone. In other words, I did not just list all the things I wanted as an artist and expect this list to be fulfilled. I put my entire art path in God’s hands. I asked for complete direction and took my hand off the door handle and let God open all the doors for me. In turn, I never worry about my art business because my path is already planned, each corner I turn!! Even down to the little things like the sale of that next painting or where I will show my art. Putting God as the first person I talk to each day, the one I ask for guidance for any decision, allows me the peace in knowing my path is already sanctioned by God. Does this mean I sit back and not work hard, but expect opportunities to fall into my path? Absolutely NO. Most that know me will say I am one of the hardest working people they know. The difference is, there is this walk in such faith that I have because I have asked for guidance by God that I know the desires in my art world are in sync with God. … all things new, in time. This is the first year in six years that I put up Christmas decorations, tree and all. Down deep, I guess I was depressed by my mothers health, then death. I truly believe I started grieving losing her to Alzheimer’s before she left me for Heaven. I miss so much about her. We spoke every day, most days twice a day. She always wanted me to be happy. She helped me through every problem I was having, every decision I was making. She was such a huge part of my life and I can hear her voice now encouraging me even when we were miles apart. Nothing prepared me for losing my mother twice, once to Alzheimer’s and then to her actual death. I have had friends throughout the years lose their own mothers and I felt sad for them but I really had no idea how painful it was to lose someone that was so close to my heart, soul and spirit. Perhaps, if you have not lost your mother, you cannot fully understand the depths of grief that overcomes you. The pain has been crippling, and random moments of memories bring burning tears. I recently admitted to myself that I have not resolved the trauma of her death, the events of those last days, the emptiness of being there holding her hand but not knowing if she knew I was there as she slipped into being an Angel. But, the main reason I wanted to share this blog was the healing power of being a believer brings. I know that I will never see my mother again physically, but I will see her again. She was a Christian and her spiritual life has gone on. She no longer carries the painful chains of her disease, she is free now. She is in God’s presence and no longer fearful from the disease she lived with. I am reminded of the verses in the Bible, Revelations 21:4-5 that both helps me in my grief and in knowing my mother is actually in a better place. I selfishly cannot wish she were still here when she was in so much pain. I held onto this pain of her death and those final days in hospice for a long time. I am a strong Christian, but her death held me in captive. The loss and the events consumed me to the point I felt like I could not breath and by not decorating, it was like I was in suspension. I knew better, but I also know there is no limit of time on grieving. If you are grieving, consider reading Revelations 21: 4-5 and really believing in the words. Record your thoughts in a prayer journal and give yourself time and space to grieve. Then……….. go decorate that tree!! Call me a Confident Woman? I was recently reminded by two of my followers that I had not posted anything lately and that is true. I like to just pop off the saying…. “life happened”. But,life just did not happen for me, it was all planned out even before the days that turned into months passed. I believe when we ask God for something He will answer that prayer. I also know that many times we (and I include myself) are afraid to pray for something as we do not think we deserve it, or it is too big for us to think God will give that desire to us. Believe, if we are not supposed to have it, it will become apparent that we are to either wait for it or allow God to show us what we are supposed to have. I have had other people, both men and women tell me they feel I am a very confident woman. While this did not happen over night, I am 100% certain that this confidence people see in me is my letting God have control of my path. I guess you might say this has made me fearless in stepping out and doing new things, Along the way, I have had people tell …. “don’t you think you should do this or that?” Well, my answer to that is… if I felt what I was doing was God leading me, do, I do not second guess what I am doing. Are there days I feel vulnerable and hiding under my covers….. yup!! many days, but then I feel this little voice telling me to get my heels on and start kicking again. I honestly think many of us are afraid to ask for something as God just might give it to us and then we have to be confident enough to step forward. IT is like we are so surprised God would actually open that door. Well, I ask and then when God says YES, I confidently walk through that door. When I feel afraid, I remind myself, I am not alone. I also know that there are things I would like to do in my life, but I am waiting on God to open that door. I know all too well if I rush it, I in my own power will fail. If I wait for God’s timing, how can I fail? So what you see in me, those that call me confident, is not MY strength or my doing….. it is all God’s. I guess a better way to say it is that I am confident in Christ. Do not be afraid to ask God for the desires of your heart. Do not be afraid to then step out with confidence when the door is opened. AND then know with your whole heart, God it there with you. I am not sure who will read this as I have not posted in so long, but my prayer is if even one person will step out with me on this journey of being a confident women, then I know it was meant to post. I am in such awe at the thought of how many times God’s timing has proved itself to be “perfect”. I would say that there are also MANY times I have not understood His path… at first. I am reminded of the saying I once heard…. As mere humans, this can be such a hard thing to hear. We pray for a situation and in our hearts, wait for that answer and many times think the outcome will be one scenario or another, and then we wait …. God might have a different plan from our desires and many times, He does. If we can only sit back and let God work His plan, we will see in the end His perfect love and answer. Is this easy? NO, it is not. In fact, at some times during our pain, we might get depressed. I want to tell a sweet story about how God answered a prayer in His timing and how the end result was incredible, or in this case, perfect. As many of you know, my sweet daughter in law lost her dear little dog, Holly. She loved Holly and she was her little furry companion. Holly was such a sweet part of her life when she was going through so many trials. In September, Holly became very ill and died in Addy’s arms. God has to have a plan in his vast master blueprint for pets in our world. They give us so much joy and comfort. Their requirement of food and shelter matches our need to give. When they are gone, we are left with heavy emptiness. Holly was not just a pet; she was a confident, a girl friend, a soft pillow, a late night girlie movie best bud. I remember my daughter in law asking me to pray for them to find another pet to fill that very lonely void. As we all know, a new pet cannot replace our lost friends, but they can fill a hole of loneliness. Tears turn into laughter. So here is her story. My daughter in law found her little perfect fury friend. The cutest little white Pomeranian came available in Florida, but so far away! They lived in the Mid-west!!! But this sweet little boy was perfect. How could God have the perfect puppy so far away? But my daughter-in-law could not get this sweet white ball of fur out of her heart. She called about him even though the miles were far and the center informed her they just adopted him out. Addy would have found a way to get to him, but he was gone to someone else. Why did God allow this to happen? He was perfect. So, let’s fast forward… a couple months. God was not saying NO, He was saying, NOT NOW. Wait Addy, wait for me to allow my plan to be perfect. God knew Addy was going to be in Florida in December. The day before she arrived in Florida, (3 hours away from the site where this sweet pup was adopted), God plan was going into effect. The family that adopted Pumpkin, realized they were too old to handle an active little puppy. Sweet little “Pumpkin” was again up for adoption the day Addy was to arrive in Florida, 3 hours away. NOTE: Addy was initially 25 hours away!!! SO, what is the message! Many times God puts a plan on hold for a reason. We might become impatient, or upset that we think God is saying NO, but what He is saying is…. not now and please wait for me to work thing out. We may hurt and desire to have an answer and even want to take the reins but God has a perfect plan. It is not easy to wait. But God does have a plan and His plan is perfect. Put a Wig on Your Head and be Happy! I recently bought two wigs to wear. When I bought them, I had the intention of looking like the model in the picture and taking 20 years off my entire body!! Seriously!! Well, that did cross my mind. But that is not the reason. Let me tell you what happened when I got them. I put on the short haired blonde wig and surprised my husband when he came home from work (I work from home). He honestly thought I had cut my hair. He could not tell. By the way, my little girl cat Diva could tell and she wanted to grab it off my head and run away with it. Maybe she thought it was another animal for her to play with. After I laughed at my husband I took the wig off and said “see… I still have long hair!” He asked “Why did you buy that wig?” I said, I not only bought this short haired blonde one, I bought a mid length dark hair one. Well, he hated that one. I would have been a bit mad at him for thinking I was crazy, but I did not buy them for him, I bought them for me. I LOVE both my new wigs. So why did I buy them? Am I going to wear them? And the answer will perhaps surprise you. It is not to look younger or to change my looks, but to just have fun. Menopause and post-menopause can only be explained and truly understood by those that have or are going through it. Even perimenopause which was a long time period for me is hard to deal with. No man can, no matter how sweet he is, understand the emotions, the lack of emotions, the depression, the tears, the desire to be free, but be held all at the SAME TIME, the fears, the …. fill in the blanks here ladies. I bought them for me to allow myself some “me time” so I could be a better me FOR HIM. Ok, I have heard, take vitamins, exercise, do not eat dairy, drink green tea, stand on your head….. yup, I have heard it all and yet, we may try these things but do we find that they work? Some combination might, but underneath it all, is the body that is strange to us. I have had close friend tell me she feels like the “body snatchers” came and invaded her. Here is what I have come to the concluded for ME ONLY, but wanted to share with you. I am going to be depressed. I am going to feel like I have no friends. I am going to feel like my husband will never understand me. I am going to hate that my skin is dry, my hair is thinning, my body is sagging and I will accept all this because as Christians, that is what we do, right? But, I will NOT HIDE from it. if I hide, I am not helping anyone especially myself. I have now learned to ALLOW myself time to be NICE TO MYSELF. If I want to cry and watch a sappy girly movie all by myself, I will and not let those around me tell me I am … acting funny. I am going to also get over that emotion and come back to earth, but not allow myself to feel like there was something wrong that I needed time alone. Once I told those around me that I needed time to mourn my bodies weirdness, I allow myself the time to heal. I do not beat myself up. There are days I am so blue FOR NO REASON at all but I will allow myself to be blue as long as I know my ground rules. The KEY…. is to not let any of this become a habit. If I feel grumpy, I allow my time, but I to not let my grumpiness become a habit. Once I allow any feeling to last too long, or get in the way of my relationships, I ask myself, do I need more time to heal or do I need to fight through it? So the wigs are one of my ways to be nice to myself, and enjoy my good moments. If I need time, I will put on one of my wigs and just be happy. I can laugh to myself and no one (but you that have read my blog) will understand my silliness. I am allowing myself to have my time. Psalms 44:21 ” Shall not God search this out? for he knoweth the secrets of the heart.” God knows how hard this is for me and he knows how I am and how I react. I pray daily that God will walk with me through this path, and I know He will. I am wearing the dark haired one today!! With bright pink lipstick. Is All Well With My Soul? For two weeks I have been depressed and could not figure out what was the trigger. Many times if I can go to the trigger of my feelings, I can take steps to work through my issue. But I just could not figure it out. Well, this morning I DID!! I started painting 6 months ago from being inspired by my daughter-in-law Addy. I remember our first painting together, I still have it. (look to the upper left corner of the wall) Addy and I love to make messes. We do crafts when we are together. Note here: God gave one of my best friends when he have me my daughter in law. So, I made a visit out to their home and she got out all her canvases and paints and brushes. 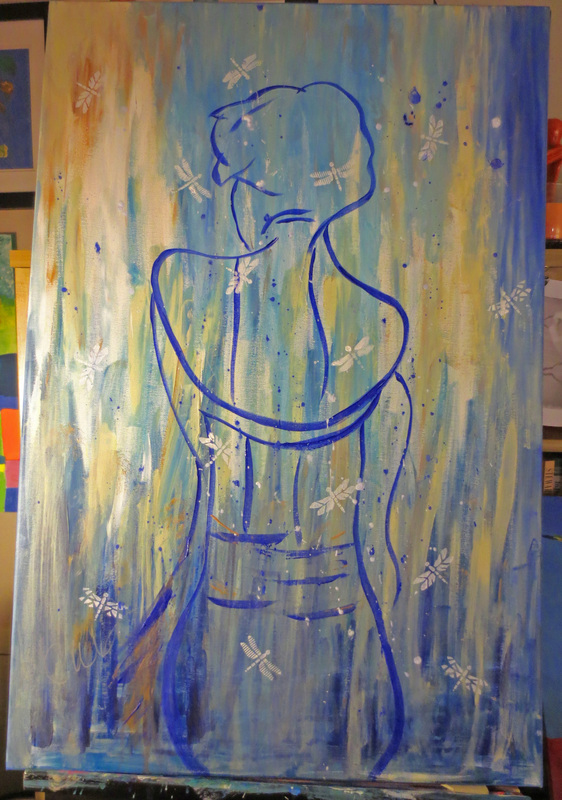 I was so excited but sat down with a little canvas and paint and a brush and was paralyzed. Looking a blank canvas is such an intimidating feeling. I did not know where to start. So Addy helped me. In fact we did the painting together. She taught me balance, shadowing and so many other things that day. That was my start into loving painting. I love new blank canvases. 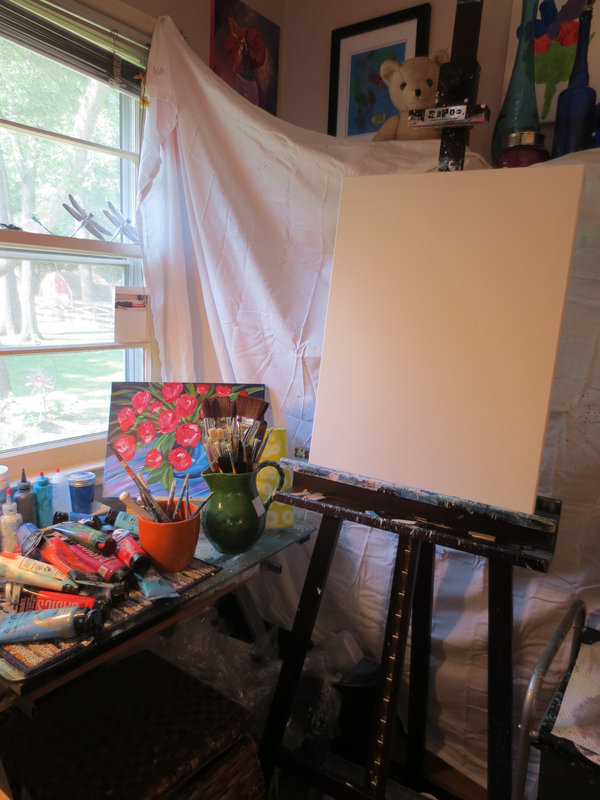 I love the chaos of my little office having no room to move because of all the paint, brushes, and easel. But, God was working in my heart. This week someone asked me why I named one of my paintings a certain name? I thought I was giving him the answer he wanted, but he kept saying I was not telling him my inspiration for the painting. I answered him THREE times and was getting a bit frustrated with him. He said he did not want me to tell him how to look at the painting, he wanted me to tell him what inspired me. So that took me on a journey. What is my inspiration when I paint? Is my heart in the right place, am I really doing this for God’s glory? Was everything right in my soul? I thought so. I called my dad (it used to me my mom but she has dementia and I have lost her). My dad is a musician and incredibly talented artistically. He said each painting should say something for others to feel. I looked to my FB page of new artists in their journey for their input. Many of them paint from a photo, or another painting and paint realism. Their inspiration is already formed when they pick up the brush. Many of them struggle with inspiration on a blank canvas. Then I got on my knees and went to ask God. I have always been a controlled business person in my business career. Rarely did I stray from the proven into the world of an unknown outcome. Even as a Christian I always thought I had to be controlled and structured all the time. I never made a mess. Even my dear husband told me several days ago to stop painting for awhile and let my inventory sell. That very day I painted a painting that sold for $850 within 2 hours of posting it. I am not saying do not listen to your husband, but I am saying listen to your heart. Trust when you are asking for God to speak to you that He will do just that. AND THEN LISTEN! 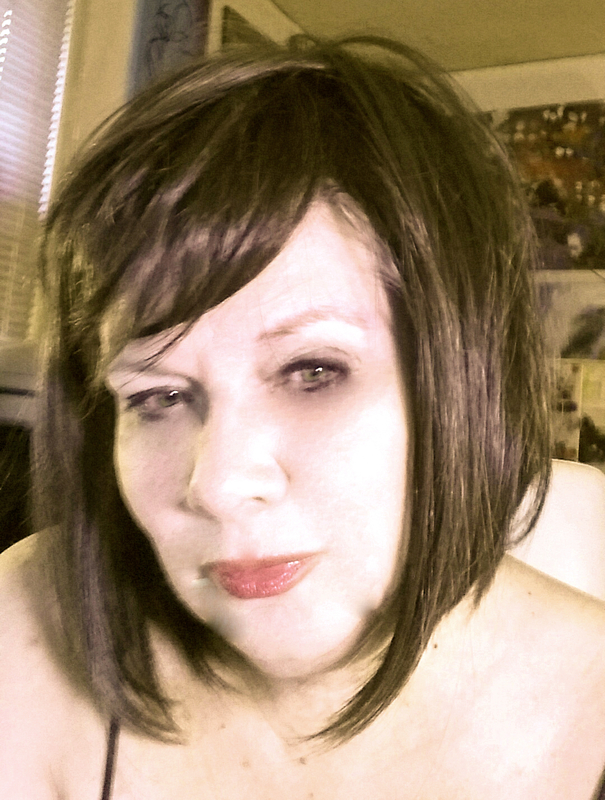 I am almost 60 years young and for the first time I am letting go of the safety net of structure and a controlled state and I am letting myself the freedom to actually be inspired. I have found that I feel more alive doing abstract where I have no idea of what I am going to paint. I let the paint land on the canvas and take on a life of its own. I cry when I paint many times because the feeling is like none I have ever had. When I paint, I WANT to be uncontrolled and be free in my mind. I want to let creativity run wild and throw caution to the wind. The battle I was having is that is it is ok to be free and unstructured. I am not a failure because get paint all over the floor or that I left my brushes in the water for two days because I was painting for 2 days!! I am so out of what I felt was the norm all my life, but I am walking this path with God and it is ok. YES, all is well with my soul today. This painting is in honor of two VERY special women in my life. Two women that have overcome struggles but through God’s intervention have overcome and survived to accomplish great things. I believe God makes NO mistakes. In my personal journey, I am very passionate and emotional about many things in my life. I also am an introvert, but I am a strong woman. That might all sound like a huge contradiction, but it really is not. Through my life as a passionate and emotional woman, people have mistaken my emotions sometimes as a weakness. I think sometimes people mistake passion for a weakness because this world seems to have gotten so hard. As I am 58 years young, I have experienced tragedy, sadness, loss of my family, along with joy, happiness and at times success. I have had to learn how to overcome thing I wanted to share with you in case my experiences might help you become stronger. I believe in having mentors in your life. I have one now. I always have had a personal mentor and a professional mentor. The personal mentor is for the spiritual and personal side of me and I have always had a Christian woman in this role. My professional mentor is separate as I want a different person as the focus is different. My business mentor is a male. I wanted to share with you something that both my personal and professional mentors have taught me and is has taken me YEARS to master and I am still mastering this. No matter if my pain is from a personal relationship, an emotional situation, or even a health issue, if I react to it I could let the event overcome me and eventually emotional drain or drown me. If I give the situation its own control then the situation (or person) has control over the event. I have had to learn to be the one in control. I have the personal walk with God and want to be still and let Him talk to me. God uses my passion and shows me the way, whether it is with a small voice or a stroke of my paint brush, I want to know I am in control of me.